If I have a "signature shot" this would have to be it. 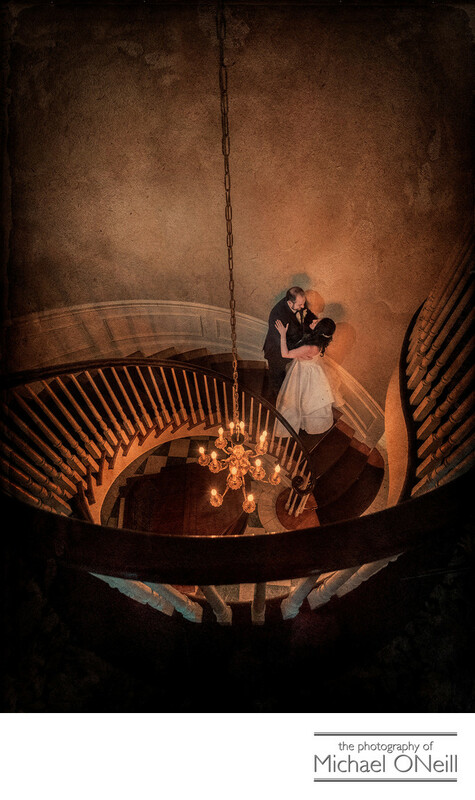 This wedding photograph was taken on the beautiful spiral staircase located in the main lobby of The Royalton Mansion at Roslyn Country Club in Nassau County, Long Island, New York. I first captured an image similar to this one at a wedding five years ago. Since that time the picture has appeared in a full page display in The Royalton Mansion’s advertising brochure but more importantly it has become a must take photo for every bride and groom that retains my services to photograph their Royalton Mansion weddings. This pic was also honored with a silver award from Wedding and Portrait Photographers International (WPPI), a court of honor award from The Professional Photographers Society of New York State (PPSNYS) and a Best-In-Show award from the Professional Photographers of Greater New York (PPGNY). The image requires that your photographer has a super wide angle lens in order to capture the swirling lines of the elegant spiral stairway. A simple wide angle lens will not do. Secondly, there is a tremendous amount of post processing in Photoshop and Lightroom, combined with some proprietary textures of my own design, that go into giving this picture it’s dreamlike antique feel. The first time I retouched and enhanced (edited) this image I probably spent almost an hour getting the effect just right. Now I can duplicate it in a matter of seconds. Though I have seen many other photographers who have tried to copy this shot none, that I have seen, have been able to reproduce the unique tones and textures that give this image it’s amazing impact. If you are planning a Royalton at Roslyn Country Club wedding and wish to have this signature photograph, give me a call. I would love to capture it for you.